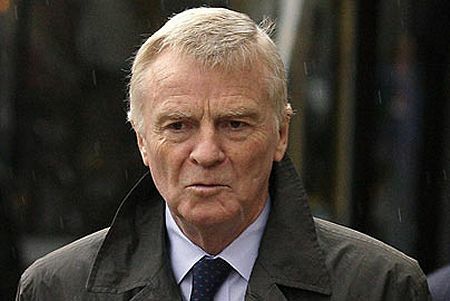 I read often of how intelligent a man is Max Mosley and I have to admit that he seems endlessly capable of surprising us without even a glance at his private life. He is a lawyer, we are told, as though this automatically identifies him as one of the intelligentsia. In fact, lawyers tend to be rather unimaginative in their thinking, being bound to precedent and the perennial inspection of miniscule detail, as they are. And there are bad lawyers as well as good, with no track record for Mosley to enable us to decide which category he fits. Then people tell me that he also studied physics at university, as though this must mean that he understands the complexities of F1 car design. But he was also a partner in the failure that was March, an attempt to become a chassis supplier to others that never approached the necessary quality and ingenuity of design. It seems his physics was not quite sufficient to make a difference there. And now this master of versatility has announced that he wants to see all F1 teams use the same engine, as well as standard suspensions and gearboxes. This will help to cut costs, he says. It does not seem to have occurred to him that it will also leave the manufacturers with no reason to compete in the sport. Their teams have to justify their existence to their respective boards of directors and the promotional aspect is by far the most important reason for their being in F1. If they are forced to use the same engines as everyone else, what exactly will they be proving about the quality of their road cars and the superiority of their engineering? They would be out of the game before Mosley's standardized engine ever saw the light of day. In view of the fact that Mosley has already ensured that F1 is dependent upon the manufacturers for its future, this drive towards a spec series (for that is what it is) invites disaster for the sport. The small constructors have been so squeezed that there are only two left, with one customer team facing the enormous expense of becoming a constructor in a year. From where does Mosley imagine new teams will arrive if the manufacturers quit overnight? The truth is that Mosley's plan is devoid of any clear thinking in connection with the future of F1. It seems that he may be reconsidering his stated intention not to stand again when his term as FIA president expires in September 2009 - and a bigger disaster for the sport cannot be imagined. Time and again he has demonstrated a singular lack of intelligence and an inability to think things through. Increasingly it becomes clear that, without Bernie Ecclestone to tell him what to do, the man is totally unsuited to be in charge of anything connected with motor sport. The time for him to go was after the Indy debacle of 2005. It was obvious then that he was more interested in his own power than the good of the sport and he should have been ousted from that moment. Even if he does leave at the end of next year, it is likely that the damage he has done already will take years to repair. It still looks to me as though an alternative series is the only way forward. has he suggested a name for this single manufacturer series? say perhaps "formula ferrari"? anybody know if there are any studies out about how viagra abuse affects the brain? it may be overdue. I read the same thing this morning. It's probably the most stupid idea Max has had since he ignored Bernie's warning that he was being investigated about rumours of being involved in evil deeds by unknown forces. Clive, your point about the mfgs is so right on target that I find it almost impossible to believe Max would even consider spec engines. This guy is so round the bend it's laughable. What's wrong with everyone having the same engine? Cosworth DFVs anyone? Some of the best racing we ever had was when everyone except Ferrari and a few others had the samen engine. However since then Max has aggressively courted the manufacturers and spouted off about chess and road relevant research while driving out the private teams. As a result we have half the cras turning up for each race than we once had. Now the clown wants to turn the whole thing on its head. Engines and KERS need to be linked so do we have a standardise KERS system? If we do, no research will be done on it so there is no point in having it. It can only be three weeks ago he was spouting off about small turbo engines and how they were the future and would allow manufacturers to learn about the kind of engines they use on the roads. Rumour has it his October insanity rant will be on using kites and sails to power F1 cars although the term F1 will be dropped and replaced with E1 (E for ecology). The man like Bernie is a dinosaur. He is a liar and unfortunately we are stuck with him. kites and sails! i love it. it's about time he rolled out a really green option for f1. kers was just a smoke screen. Next he'll suggest electric cars and turn F1 into a big slot-car series. yeah, i always liked the slot car proposal. saves on having to write and interpret all those pesky unwritten rules. hmm, was that turbo proposal 3 weeks ago or 30 years ago? a little deja vu, max? The days of Cosworth engines were also the days of the independent constructor, Steven. It was a great time and gave rise to some of the famous names of the sport - but manufacturers only became involved again because they were free to introduce their own engines. Eventually they squeezed out the Cosworth teams, forcing them to find turbos or die. That is the kind of natural development that F1 thrives on but Max is proposing to freeze everything solid forever. Once you go to a standard engine, suspension and gearbox, what is left for a manufacturer to do? Play around with the chassis? That's more the kind of thing the small constructor enjoys. It seems Max is not even capable of devising a coherent way forward, let alone govern a complex sport equitably. He must go, the sooner the better. I don’t believe anyone rates lawyers very highly. On the social scale they rank consistently below used car salesmen. In many countries they are educated at taxpayer’s expense, and upon Bar acceptance immediately set about screwing the hand that created them, via their outrageous fees. They are consummate liars. Rarely does the client know what deals are struck behind the scenes. Mosley may well have studied physics too, but that does not necessarily mean he absorbed anything of value, or reached any recognized standard of excellence either. Indeed, given the known qualities of lawyers generally, one should routinely question any claim he makes and everything he does. Since the FIA is essentially Mosley, it is fair to say that he alone is responsible for the spec. car direction of F1 that has in fact been going on for some time already, although always under the disguise of ‘controlling costs’ or ‘eliminating the possibility of cheating’ or pretty well anything else that can be dreamed up by a devious mind, completely devoid of morals and ethics. So, will we get standard engines, etc., a proven winner for the successful(?) IRL series? Who knows, as this may well be just another smokescreen behind which Mosley can introduce another of his destructive schemes (possibly even completely unrelated) into the series. His self preservation is near perfect, so if he decides to stay beyond this current term in his quest to destroy F1 (intentionally or through ignorance), I see very little to prevent him from doing so. Sadly, I think you're right on all points, David. Mosley will stay on and we can kiss the wonderful sport that is F1 goodbye. If we wanted to see spec car racing, we would all get up that little bit earlier and watch GP2 - some do, I know, but only as a taster for the real thing. I hesitate to classify all those in a profession as the same (I have to believe that, here and there, good lawyers do exist) but it is true that they are regarded with mistrust and suspicion by most people. And I certainly do not equate their profession with intelligence. When I was at college, it used to be said that you tried for a science degree first; when that failed, you had a go at the arts; and, failing that, you became a lawyer (there was a lower rung, commerce, but I'll skip over that!). david, i don't agree with that generalization. there are a fair percentage of lawyers who enter the law from a fair amount of idealism- and practice fairly. and quite a lot of them do do pro-bono work precisely because they love practicing law and realize they have a part to play in fair representation for some of the population who would not normally have any voice at all. but i doubt max was ever in with that bunch. and sorry, clive. i keep forgetting about the wrath of max. feel free to delete anything objectionable. hopefully he never looks at my social networking sites. i'd have to tunnel my way into montreal next time i go. I think we have a fair amount of freedom to say what we think on the net, Vera, and I do occasionally use that to its fullest extent (especially when talking of Max!). But we have to be careful not to step over the boundary into baseless accusation - even though I dare say Max has not limited his utterances in the same way. Hard but fair is the way to go, I think. And I agree with you on lawyers - some are honest and have good intentions. Strange as it may seem Max has enough knowledge of physics that he was technical director of Williams. For a day. Frank was trying to raise money for his team (I am not sure if this was the current team in the start up phase or one of the previous incarnations. Frank wanted Robin Herd who became tech. director of March to go to the USA to pose as his technical director and impress the potential sponsor. Herd was busy so he suggested Max could do it. On second thoughts maybe it wasn't his physics knowledge Herd was thinking about rather his ability to talk b*******. Who was it that called F1 the world's most expensive spec race? The trouble is that it'll probably be a topic relating back to Max. He is a seriously important part of the problem. In fact, I've had a strange thought. What if this whole F2 thing is just to get a pile of constructors that Max can push into upgrading to F1 when his plans "fail"? Then he can control the teams as well as making the rules for them, cutting Bernie largely out of the equation and circumventing the current teams' attempts to defend themselves. This would explain why he's saying the entry fee will be so cheap - the FIA could afford to take some of the bills in return for getting much larger amounts from the same teams when they pay the FIA to be supplied with their spec chassis and engine (which will be whichever engine manufacturer is nicest towards Max). The GP series could be barred from having any input into the entry criteria for drivers, forcing people to use F2 to reach F1 - and maybe pay the FIA a lot of money to do so. The "boiled frog" approach to prices will be used until the cycle appears irreversible, then prices will soar until the next economic bubble bursts. When the manufacturers leave F1, Max can punish them by giving them low NCAP scores and other punishments relating to the road side of things. The increased interest may help to get the big touring organisations on his side, help unify the FIA and increase his power base. Once he's done that, the manufacturers will gradually return to F1 on the FIA's terms. It might be a couple of decades in the future, but it will happen. F1 doesn't need the manufacturers as such, and with the FIA making itself a ready supply of small teams, it doesn't matter that it's killed off the old ones, or that it will continue to do so until it learns how to handle competitive economics sensibly. Oh my goodness, Alia, that's really scary. But that's also really possible. That's quite a sick plan. It's like he'll make sure we're all locked up in his madhouse. That's the sad part about a single pan controlling all automotive work. He can use whatever he has in his control to make sure you play by his rules. Let's hope it won't happen, but you never know. Now that you've put it in print, Ali, Max has a blueprint if he didn't before. :-) The IRL spec series is not so successful. They just signed a TV contract with a very minor cable channel, VS, supposedly so they could add IRL lifestyle programming to the package. Personally I don't care what Helio had for breakfast, or who he's dating and how she handles the danger. Honda is making noises about leaving the series if Tony George doesn't find them someone to beat. And the fastest teams all do their own development on the Spec Chassis. Look at a Penske version then at a backmarker and they are quite different. And rumor has it that quite a lot of TG's money went to a number of small teams to be sure Indy would have the required 33 cars. On the bright side, if all the manufacturers leave F1, maybe they'll go racing at Le Mans which I also love. Porsche versus Mercedes versus Ferrari anyone? Ah, Journeyer, if only it was a single pan in control of motor sport. Then things would be so much easier... Joking aside, I really don't like my plan, but in the cold light of day it still looks feasible. Hopefully Max has a plan more beneficial to motor sport and F1 than that, but I find it difficult to be positive as regards Mr Mosley. Chunter: I don't know who said it but it is a little unfair. F1 may be going the spec route but it is not quite there yet (as evidenced by Flavio's whining about engine power). Alianora: Have you ever thought of writing horror novels? That is one of the scariest scenarios I've read in a long time - the more so because it just might happen. Watch out, Stephen King! That wasn't even intended as a horror story, but an attempt to fit the pieces together. If I'd intended it to be a proper horror story, I'd have added a couple of ghoulish plot twists about the countries holding a race being selected purely on quantity and quality of yes-men, along with some zombie stuff such as the resurrection of the stewarding and timing systems in place in the 1950s and 1960s in order to cut costs. But I was more worried about the overall plan than the details. Oh No I can see it now"Max Mosleys Mundane Motors Clone Car Championship"lets just hope it`s Max developing a sense of humour in his old age. How sad it is that we have had such unenlightened and incompetent people taking care of the formula and rules of F1 for so long. When it becomes obvious that the formula isn't working or rules are vague or detrimental to the sport, the engineering brotherhood should be sequestered away from the Mosleys and the Ecclestones. When they have come to a viable conclusion they might do as the pope, and light a little fire so smoke comes out of the chimney. (Ferrari people would be stifled with awe). The designers are the ones with the problem solving expertise! Lawyers are very specialized people and should stay in their adopted field: making money from other's misfortunes. Let the imaginations imagine. Gusto: Max and a sense of humour? Isn't that an oxymoron? Nick: And what would they burn to make the smoke? Mosley's silly proposals for regulation changes over the last decade? I'd definitely go for that! Mosley's and Ecclestone's passports would be a good start. I suggest they ignite Bernie's money supply. Unfortunately, the resulting conflagration would probably mean the end of the world. Gary C, that is probably very true, especially if they accidentally ignite F1's debts to the Royal Bank of Scotland in the process (which are about $2.9bn, assuming their payments to RBS equal their interest charges).